CAll for altars and performers! ​Mexicans do not die once; Mexicans die three times. The first death is when the body ceases to function; when the heart stops, the gaze becomes hollow and the physical space we occupy becomes inconsequential. The second death comes when the body is lowered into the ground and returned to earth. The third death, the most definitive death, is when there is no one left to remember us. El dia de muertos illuminates the Mexican philosophy of living; it is in this day that we reconcile our past and present, our ancestors with ourselves. We acknowledge our mortality and the place of dying in the cycle of life. El dia de muertos is a celebration of life, a remembrance and intimate moment in which we care for and honor our deceased family and friends. It is through this celebration of death that we continue to live and cheat death of our third and final death. Contemporary Mexicans and the larger Latin community have a complex relationship to death that stems from a synthesis of ancient prehispanic roots and the superimposed Catholic religious practices. In the current difficult and hostile socio-political environment, Day of the Dead offers comfort to many different people; those within the Latin community, as well as those outside of the traditional culture. Dia de Muertos transcends cultural boundaries because it is a sublime expression of the love felt for all those we have lost to a number of reasons, from death at the border, to failing healthcare policies, homelessness, war, domestic violence, and any number of tragedies. 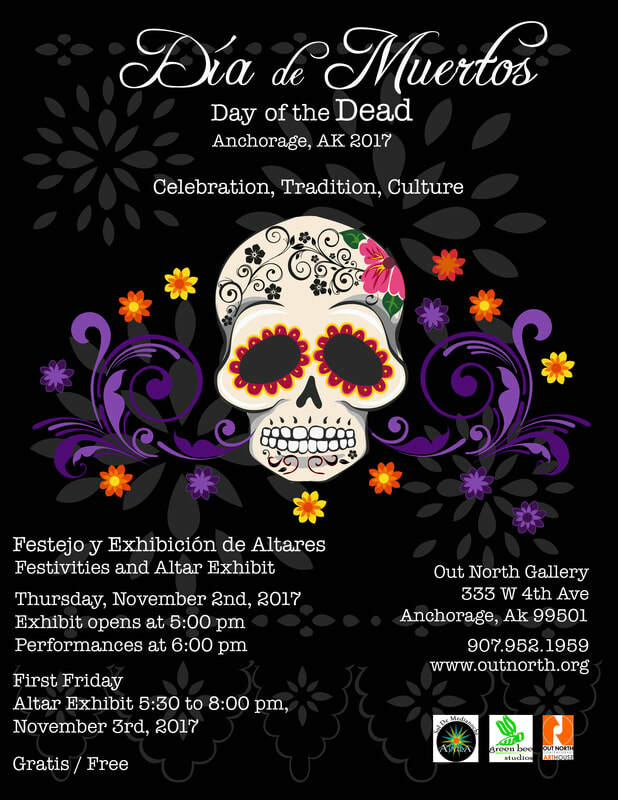 Dia de Muertos (Day of the Dead) on November 2, 2017: Sol de Medianoche, Green Bee Studios and Out North Contemporary Art House, in partnership with community members and performers, are hosting the 2017 Dia de Muertos event. The celebration will be comprised of an altar exhibit, music and dance performances, face painting for kids, and traditional foods. Altar exhibit opens at 5:00 pm. Performances start at 6 pm. The new KONR-LP has arrived!